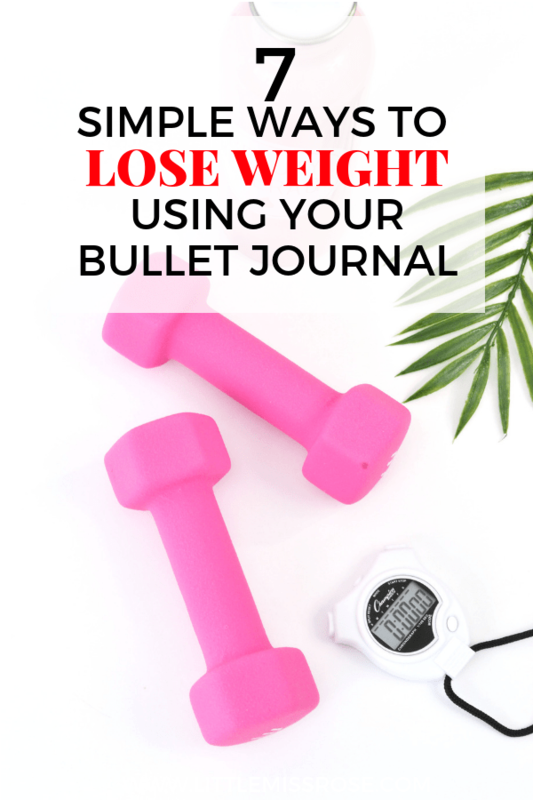 But did you know that your bullet journal can actually help you lose weight?! 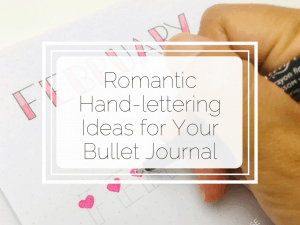 If you don’t know what a bullet journal is, you might want to read this post here. First of all, you need to set goals for yourself. And as with all goal-setting, your goals should be SMART. That is: Smart, Measurable, Aachievable, Relevant and Timebound. Make sure you’re realistic about your goals. There is probably no way that you’re going to drop two dress sizes in two weeks, unless you were horrifically sick! 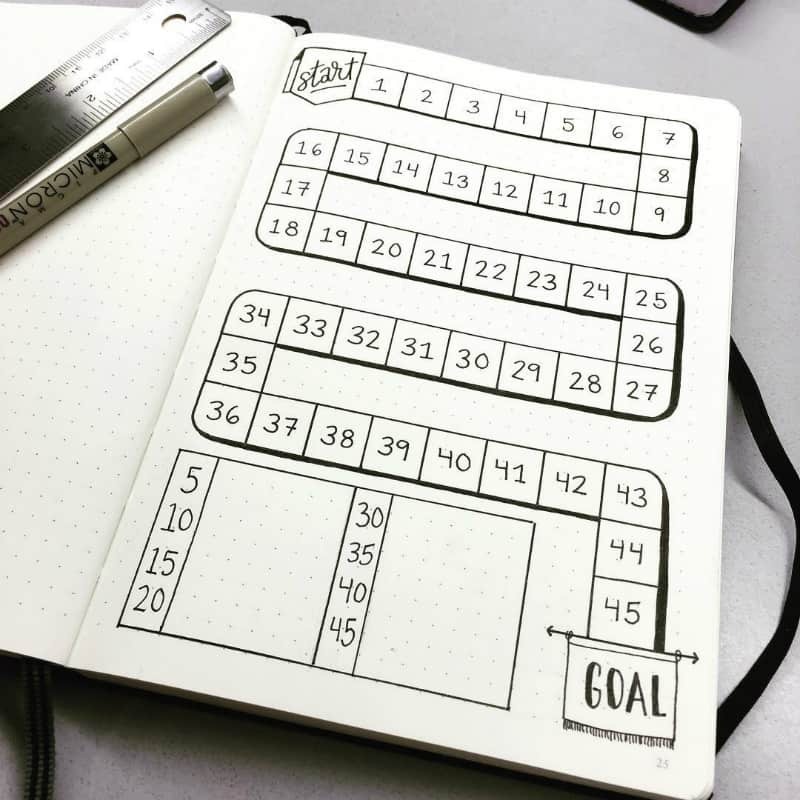 Write your goals down in your bullet journal, to make yourself accountable. 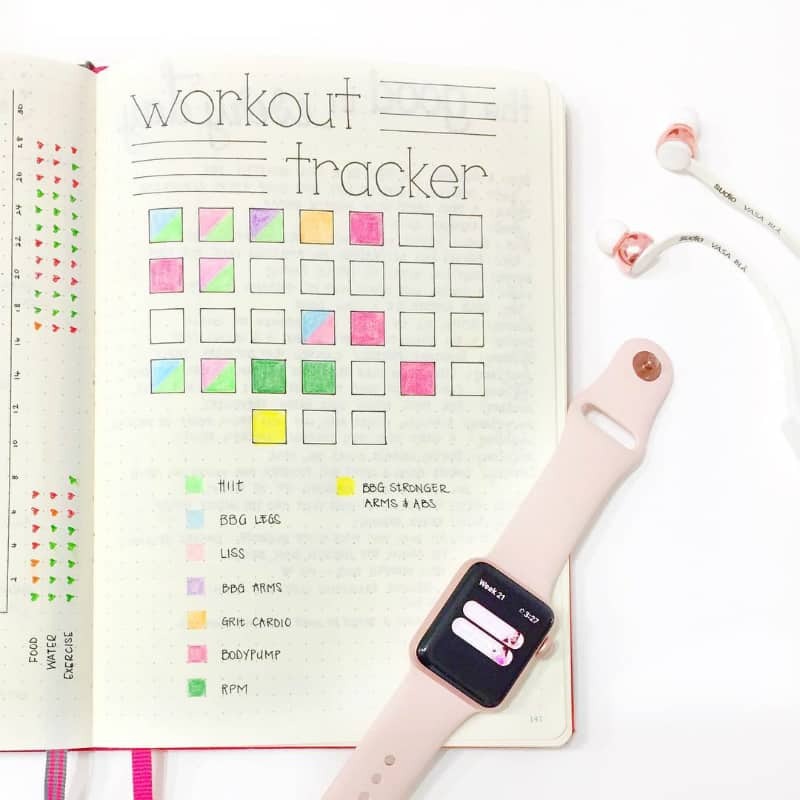 You can even create a great tracker for your goal to make your weight loss goal seem less daunting. 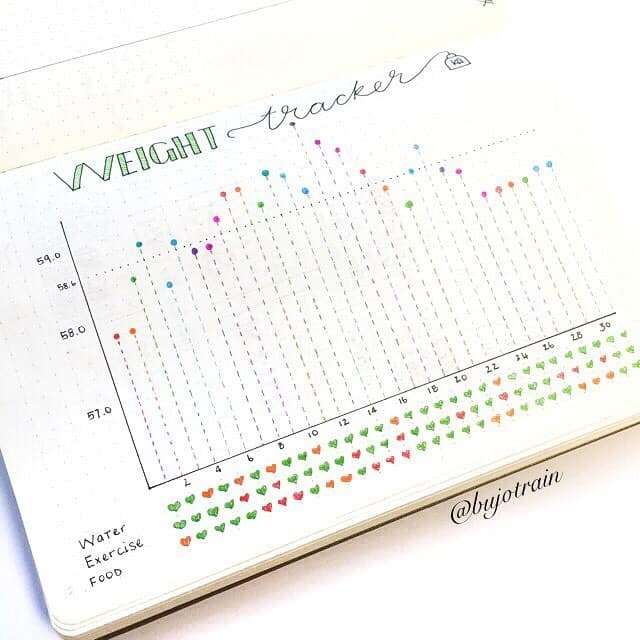 In this example, @planyourplanner has a goal to lose 45 pounds and has created a tracker to help her mark off each round she loses! Isn’t it cute? Do you know that saying – “Abs are made in the kitchen”? If you really want to lose weight, then you need to watch what you eat. You could spend hours at the gym, but that weight won’t shift if you’re still eating donuts and cake all the time. Or constantly binging on delicious take-away food. 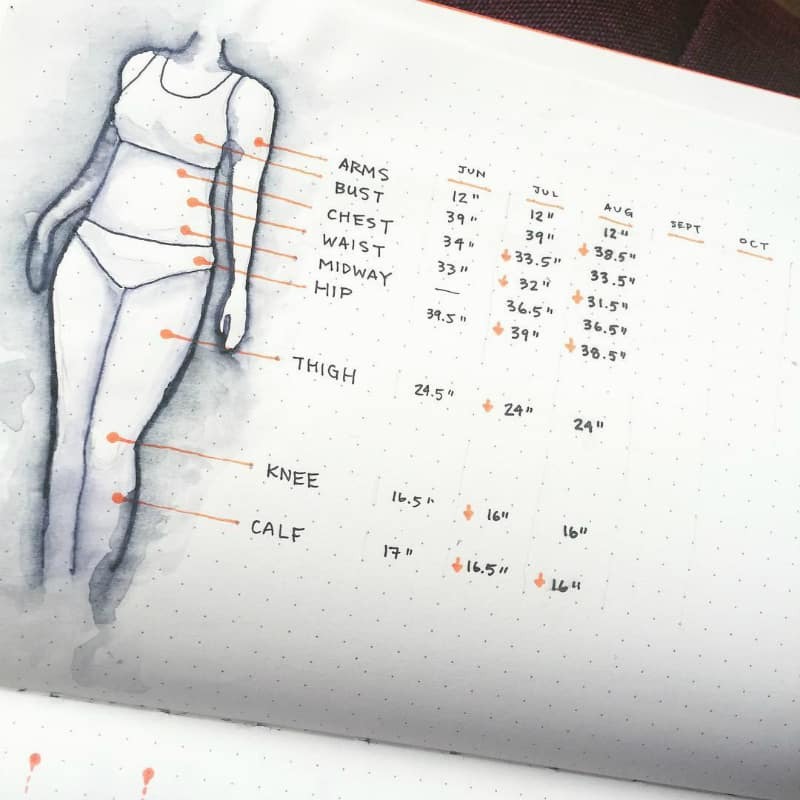 A great way to use your bullet journal for weight loss is to meal plan, so that you have more control over what you eat. And also when you eat it. 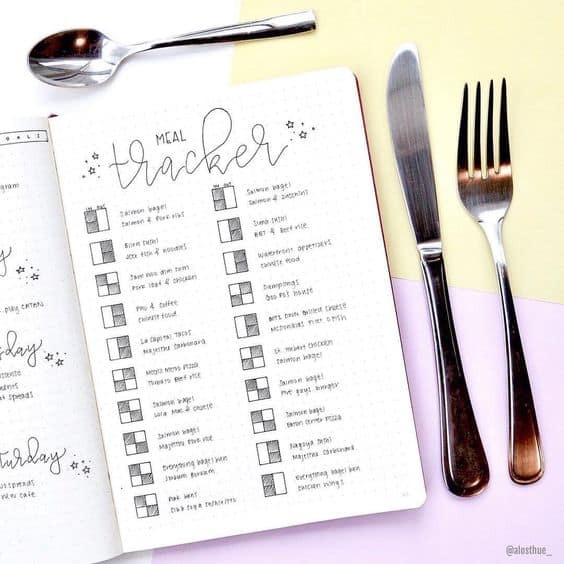 Sit down and create a spread in your bullet journal where you can write down all the meals you plan on eating for the week. With this you can also add extra fancy fitness stuff like calories and macros. 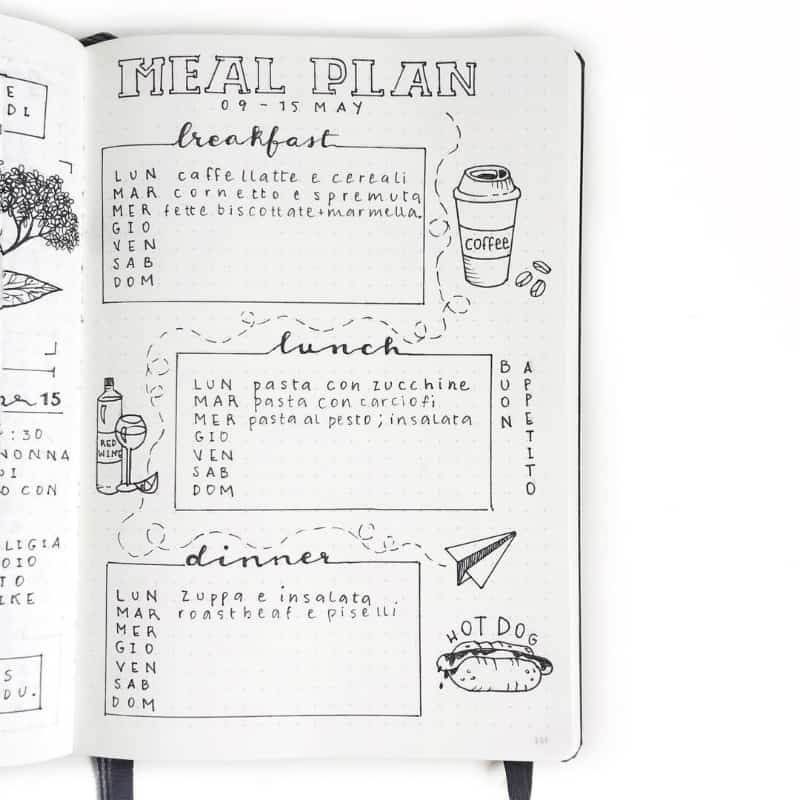 Here are some cute examples of meal plans. 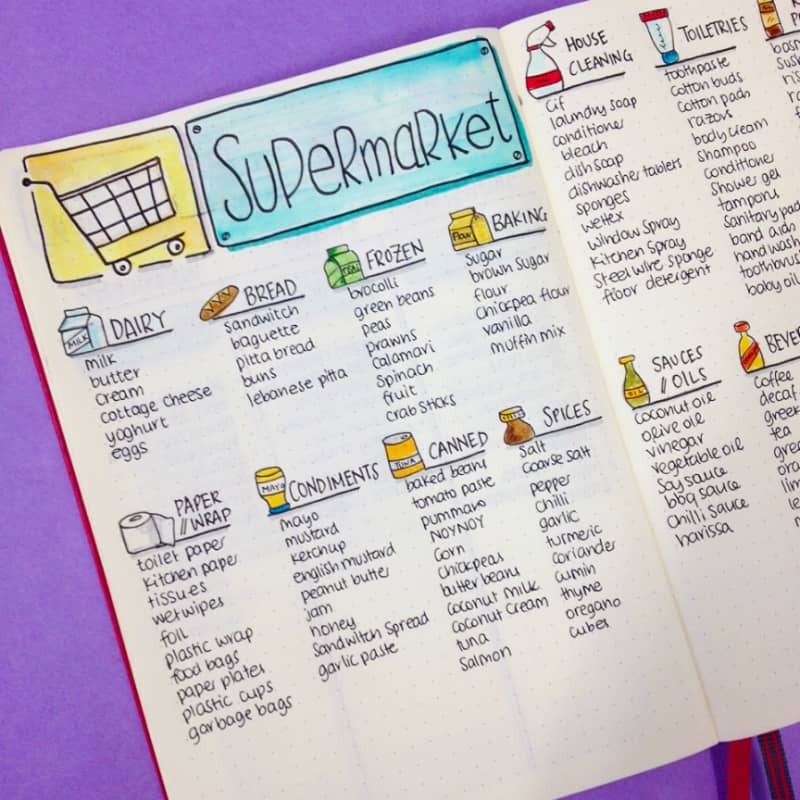 Now that you’ve planned out your meals, you need to go supermarket shopping to buy the ingredients to make them! (unless you’re filthy rich and you have people who do your shopping and cooking for you, or if you’re going to eat out all the time!). Ok, so have you ever been to the supermarket when you’re hungry, and undecided about what to have for dinner? You end up buying anything and everything right? And when you get home, you realise that you haven’t bought anything that will make a healthy meal and you’ve bought all the chips! But you also need to base that list on the meal plan you created earlier. 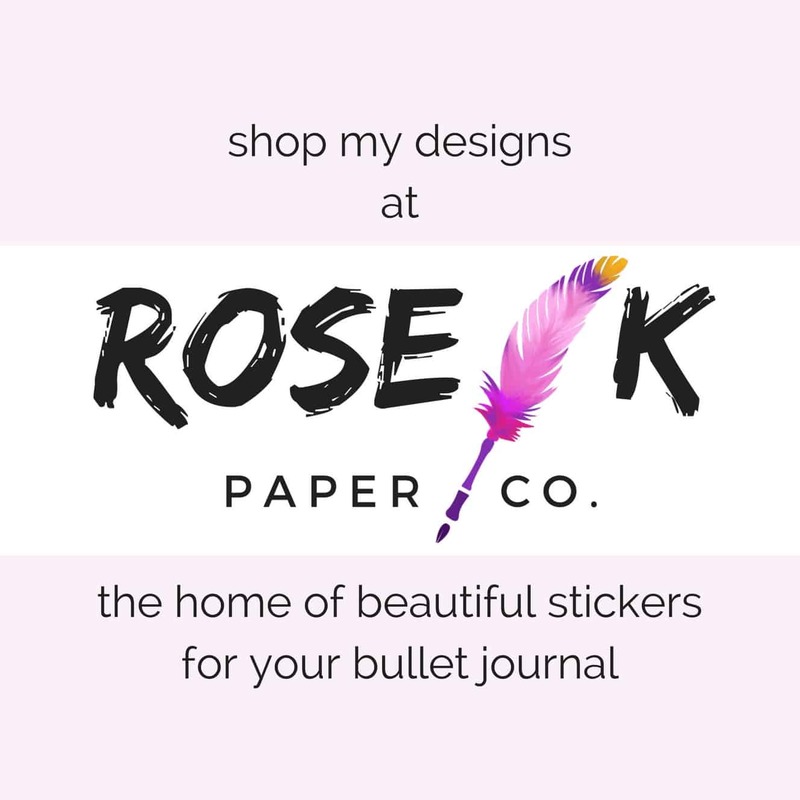 Another huge tip: REMEMBER to take your bullet journal with you to the supermarket so you can check off the things on your list as you put them in your shopping trolley. And stick to the list at all costs! 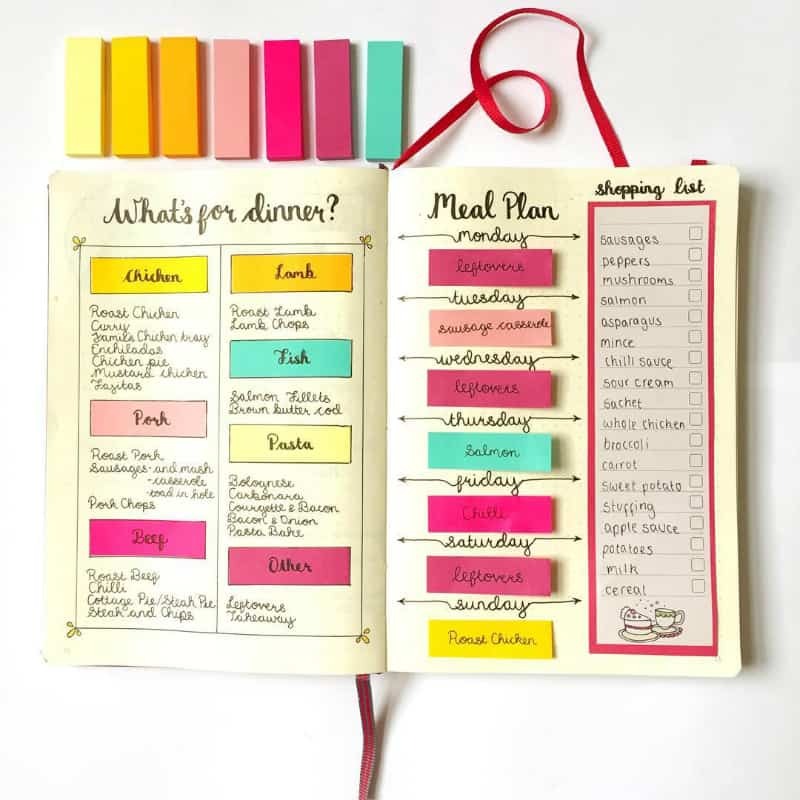 Not only will this help you stick to your meal plan of healthy foods, but it could save you some money as well by avoiding those superfluous purchases. Still having trouble sticking to your meal plan? 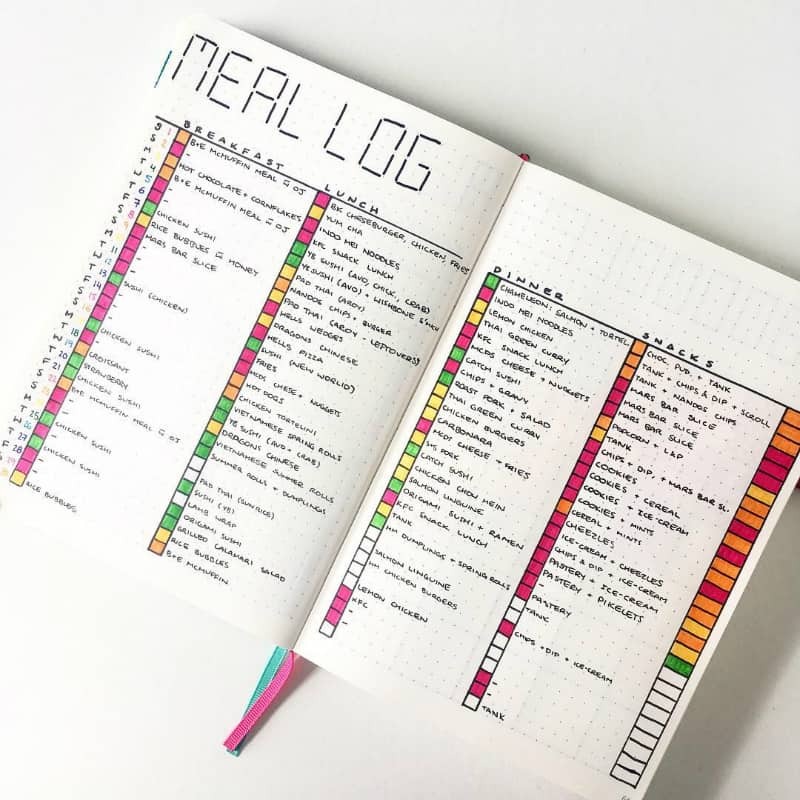 Another way to be accountable to yourself is to keep a food diary or a meal log in your bullet journal. 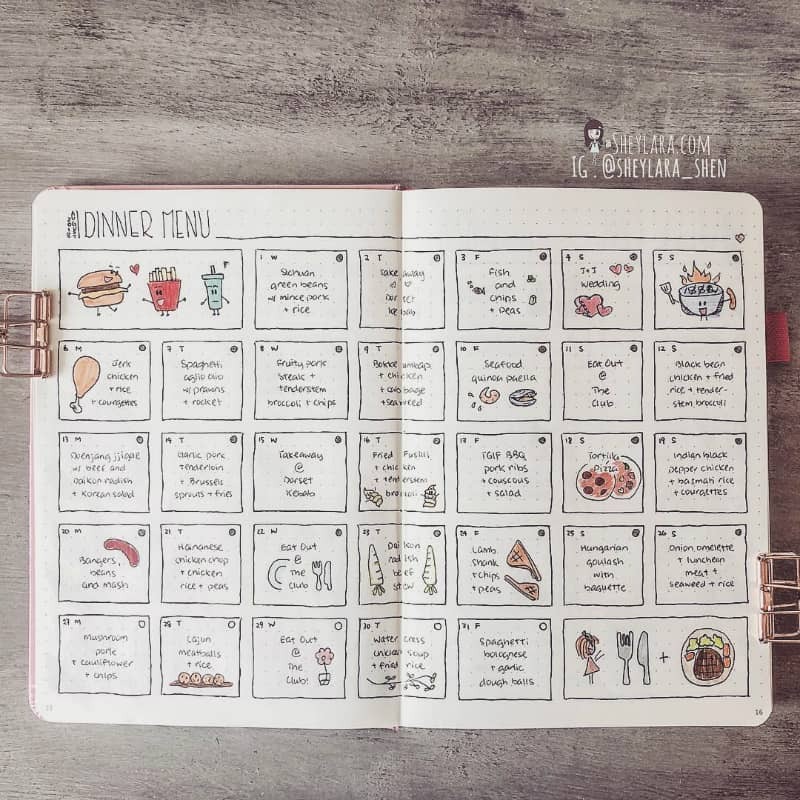 Simply write down everything you eat. The act of doing this may make you think twice before you eat that chocolate bar. Drinking water helps boost your metabolism, helps cleanse your body of waste and also can act as an appetite suppressant. So you really should drink more water. Something I tell myself to do every single day. 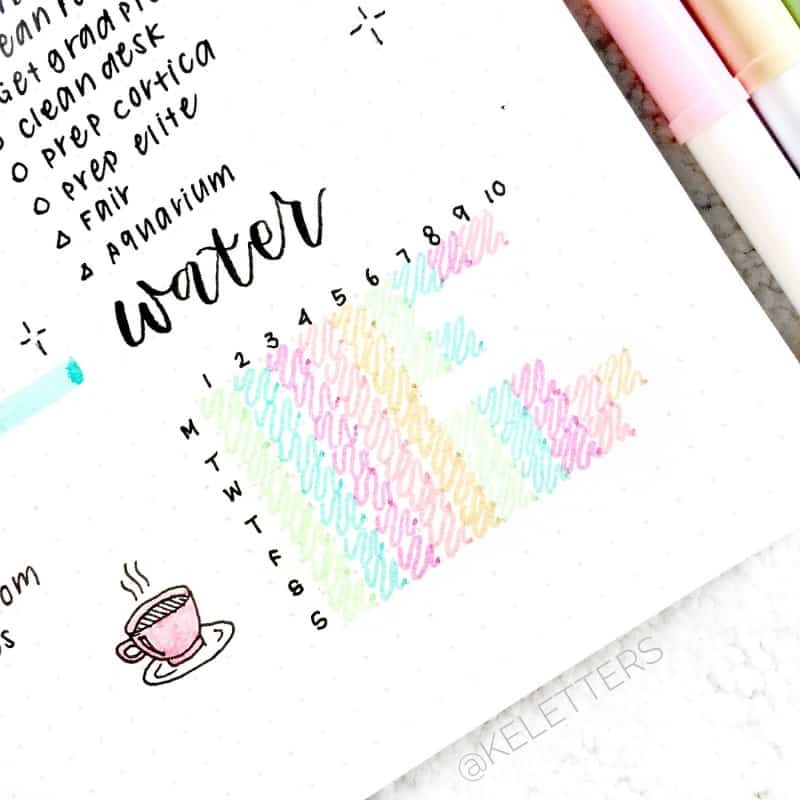 To help yourself up your water intake, try creating a water tracker in your bullet journal. Diet is always coupled with exercise for best results. You can still lose weight without exercising if you have your diet under control. But exercise is good for you, it can lift your mood, it’s good for your muscles and bones, it can increase your energy levels and prevent certain illnesses like diabetes and high blood pressure. 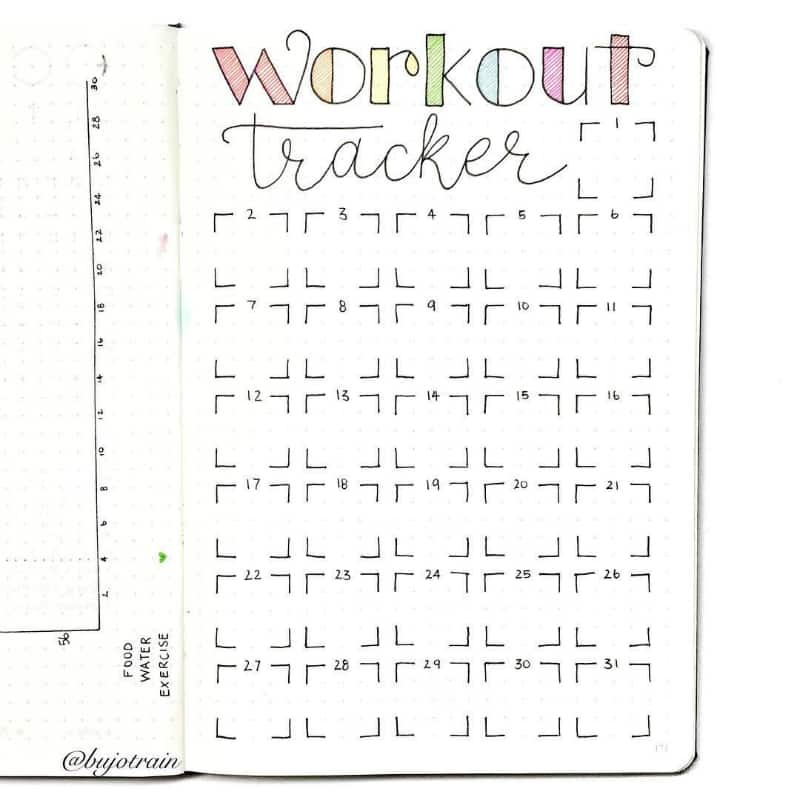 Adding a workout tracker into your bullet journal can be an incentive to exercise more. 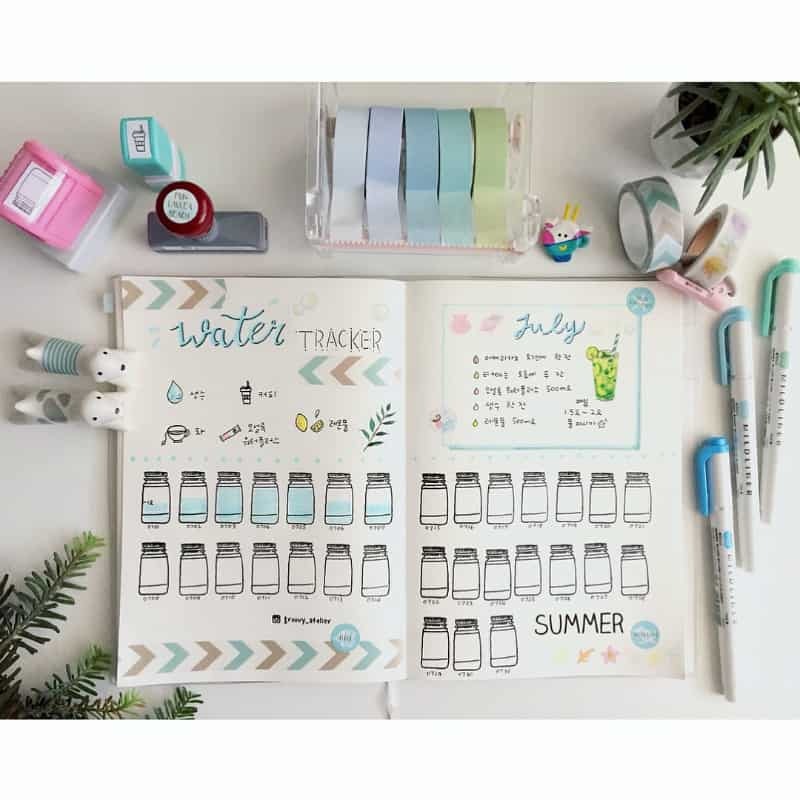 It’s always a great feeling of accomplishment to fill in another box in a bullet journal tracker. 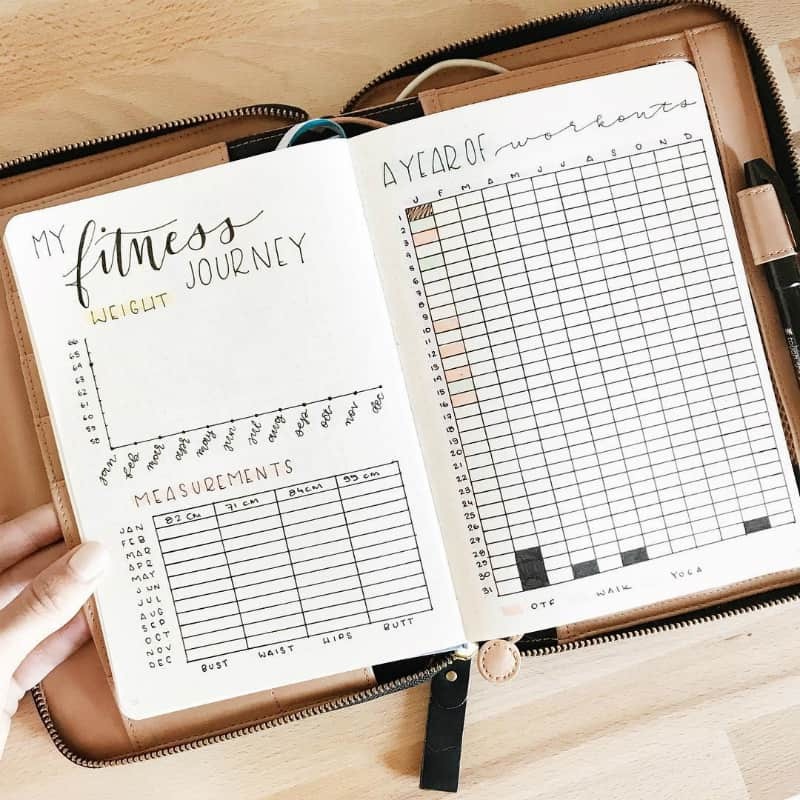 Track your goals by taking measurements of yourself. For example, weight, fat percentage or body measurements. 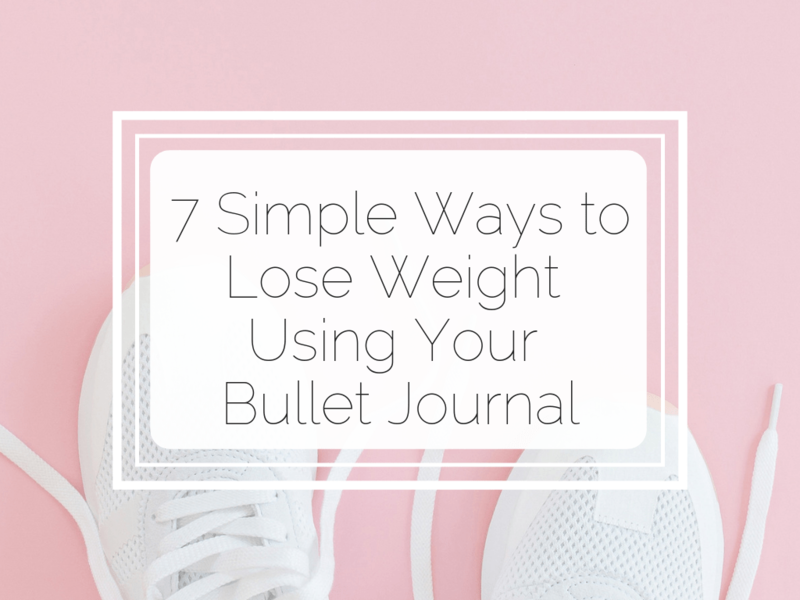 Record these at the beginning of your weight loss journey and make a point of taking these measurements and recording them in your bullet journal every so often. That way you can keep track of how you are performing! 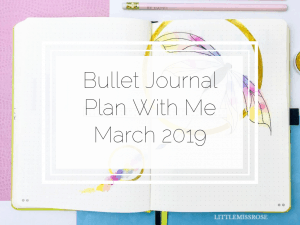 So now you know the 7 tips for using your bullet journal to lose weight, it’s time for you to take these tips and implement them in your own bullet journal. 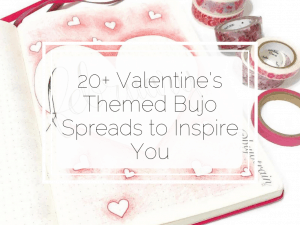 Let me know how you go and if you have any other tips to add to the list!